MetalRockNews: Amon Amarth's Johan Hegg about making concept album: "It was horrible, but it was fun as well"
Amon Amarth's Johan Hegg about making concept album: "It was horrible, but it was fun as well"
Amon Amarth frontman Johan Hegg was recently interviewed by Full Metal Jackie, you can read some excerpts below. 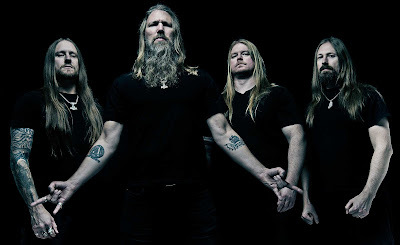 Full Metal Jackie: I'm excited about this new Amon Amarth album "Jomsviking" that's coming out on March 25. Your music already had a storytelling quality to it. Why haven't you done a full concept album prior to this one? Johan: Well, I think the main key was… We kind of always wanted to do it, but I think we never really had the perfect story to make a full album of it, and this time it just felt like it was a challenge we wanted to take on full-on, 'cause we've been talking about it for so long. Full Metal Jackie: Did you enjoy doing a concept album? Johan: It was horrible, but it was fun as well. I mean, it was a good challenge. Just to complete the story was a nightmare, really. [Laughs] And then to translate that into lyrics was even harder. But once you got all the pieces together, it was very rewarding. So it felt really good. Full Metal Jackie: It's a love story, something people might not associate with Amon Amarth. How did that challenge you as a songwriter? Johan: Well, there is a love story in the story. I think, more than that, it's more like a story of not being able to let go, actually, of the past, and stuff that happens to you, and how that eventually will kind of bring you down, you know. It's gonna lead to bad things, if you're unable to let go of the past. But, yeah, there is a lot of story in there. And I think it was important for the story to make it believable and understandable. So that's kind of why I decided to write that. And also, I think it adds an extra dimension, especially where we have the female vocals come in on "A Dream That Cannot Be", which, I think, elevates the whole album to a different level. It's something different, something we've never done before. And I thought the idea of doing it this way was really good. Full Metal Jackie: Going back to the idea of this being a concept album, do you think you would do it again? Johan: [Laughs] I guess you should never say never. But, yeah, I can imagine doing it again. I think it has to be… I mean, this idea I kind of had for a long while, so writing the story was just a matter of getting started. But if I, lyrically or storywise, have a good idea, I can definitely see myself doing that again. We'll see. Full Metal Jackie: How much of this album are you going to be playing when you tour in the U.S. in a few months? Will you do the whole thing because it's a concept album? Johan: No. [Laughs] That's an easy answer. We've been talking about possibilities, but I think to do the whole album would be… First of all, it would be difficult, because one of the songs, we need to have the female vocals there, and that's gonna be hard to do if we're touring. But I think we're not really… I mean, that's not so important. I think it's more important to build a good set with good songs. The concept story is not, like, the key here. Full Metal Jackie: Do you think it's unfair when bands sometimes surprise their fans? We're going to play our brand new album that you don't know back to back tonight! Johan: That's not for me to say, really. I personally wouldn't really do that. I mean, we did "The Evening With" show for "Surtur Rising", where we did play that whole album back to back, but then we came back and did, like, a 90-minute set after that with all the classic songs as well. So I guess you can't really compare that. But playing the full album, which is maybe an hour, and then squeezing in maybe three or four of the other songs in there, it's kind of… We wouldn't do that; I don't think so. At least we would announce that in good time. Full Metal Jackie: "Jomsviking" would make a great movie or miniseries. Are there any plans to develop the story like that? Johan: I wouldn't say plans, but I did write the whole story as a movie script. And I did even send it to a guy who's kind of involved in the movie business, who works for our management, to see what he thought. But I don't think it's ever gonna happen. But never say never. I mean, unless you send it out, you're never gonna [know]. So we'll see. I know that if you make it into a movie, you probably have to scale down a couple of things and really tighten up the script a little bit.